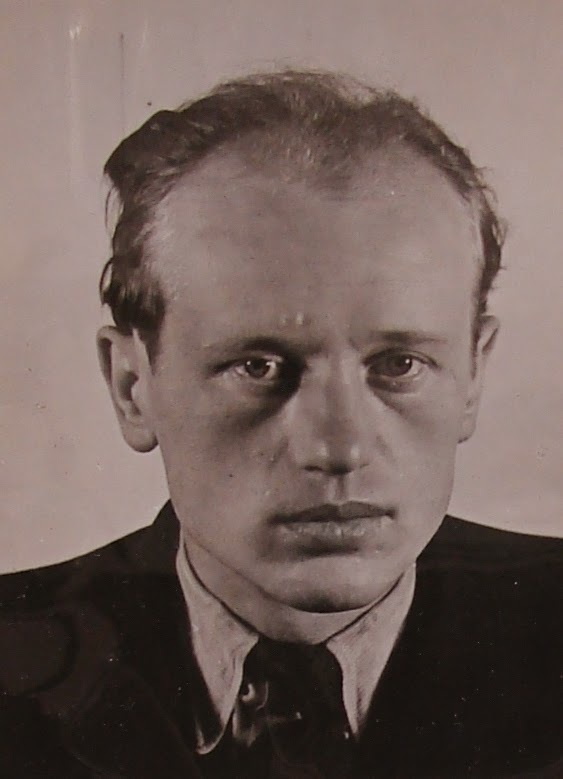 "You will see, and you can rely upon it that I shall not be less brave than Jakobs; I too will know how to die, yet not as a Nazi spy on your gallows, but as a man." Karel Richter had a specific idea in his mind of what "brave" meant and it looked like this. "On the preceding afternoon Albert Pierrepoint, the hangman detailed to carry out the execution, arrived at the prison [Wandsworth]. As was the usual practice before executions, he was allowed to view the prisoner, without himself being seen. This was to assess Richter's physical characteristics--build, thickness of neck, etc. to be assessed together with his height and weight (given as six feet two inches and fifteen stone four pounds respectively on his medical card), to calculate from a table of figures the precise length of rope required. Richter was in the prison yard between two burly prison officers, his lips shut in a grim line, making no attempt at any sort of conversation. As was normal practice, the hangman slept at the prison overnight. The following morning, Pierrepoint, with his assistant, the Sheriff, Governor, doctor and warders were outside the condemned cell a few minutes before eight o'clock. Here a few words should be said about the lightning-fast procedure at a routine British execution... to appreciate what happened in Richter's case. The executioner and his assistant would wait outside the condemned cell. At the signal to enter, given by the Sheriff, they would proceed into the cell. The executioner would then pinion the prisoner's arms behind his back, after which he was escorted through the communicating door to the execution chamber, the trap doors being level with the floor. The Sheriff, Governor and doctor entered directly by another door from the corridor. The prisoner was then placed on the drop on a chalk "T" mark lined up with the crack in the trap doors. The executioner then placed a white linen bag over the prisoner's head and the noose around his neck, while the assistant pinioned his legs. When the executioner saw that all was ready he pushed the lever. From the giving of the signal to the trap being opened, the time was seven to twenty seconds. Pierrepoint has recorded that many times the clock was still striking eight after the trap doors had opened. 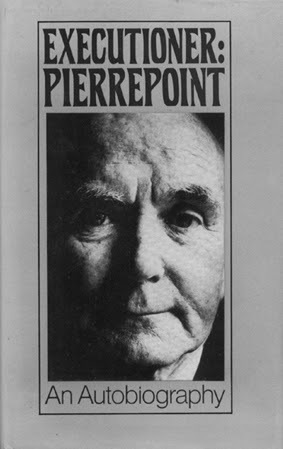 [Now comes] Albert Pierrepoint's own account of the execution of Richter, the only condemned prisoner in the hundreds he has executed, including other spies, to cause trouble. 'I was outside his cell on time next morning, and when the door swung open I got my first shock. Richter should have been sitting at the table with his back to me. It is usually arranged that the condemned man should be in this position, so that in three quick strides I can be behind him, tapping him on the shoulder and taking his arms to pinion his wrists behind his back as he stands up. But Richter was standing at the far side of the table, glowering at the open door. I had to walk all round the table to reach him. His face was working angrily. His eyes were staring, very blue and dangerous. His big fists were clenched. Before I could reach him he heaved away the nearest prison officer and dived like a bullock at the stone wall. His head cracked against the masonry. My first impression was quite irrelevant. It was the flurry of robes of the Catholic priest as he tried to get out of the way of the battle which followed. It may have been Richter's intention to stun himself so that he was hanged unconscious. I do not know. He stunned himself only for a moment. He lay like a log on the floor, then raised himself and shook his head. The two death-cell officers dived on top of him. He clawed and kicked them away. Two more officers rushed in from the corridor. There were five bodies thrashing on the floor, and one of the men in blue was an accomplished judo expert. Someone gasped "Get your straps on him, Albert, for God's sake!" I was circling round the melee, waiting my chance to do this. I managed to engage one of his wrists. Then I brought the strap round the other. Officers were sitting on his legs and then they began to drag him to his feet. I turned to go through the cell into the execution chamber. It was not the sort of occasion when I should say sympathetically, "Follow me, lad. It will be all right." Suddenly there was a shout from behind me: "Albert! Albert! Come back!" I turned and saw that Richter's arms were free and it was a free-for-all again. With his hands behind him he had strained on the pinioning strap around his wrists and split it from eye-hole to eye-hole. I would not have thought such strength was possible. I went back and got into the fray. Richter fought me, fought everybody. I managed to get a grip on the strap. Normally I had never put on the pinion very tight: I had found it was psychologically wrong to make the prisoner feel constricted , or angry because a buckle was nipping into his flesh, and that generally only the suggestion of restraint was enough, while for practical purposes the arms could not fly outwards anyway. This time I had no choice. I had to get the strap to fasten on an inside hole. I was strong, and I dug my knee into his back and pulled until the strap was secure in a second hole. Once more I started towards the scaffold. Karel Richter exhibited the "animal resistance" of which Emerson spoke, the urge to fight in the face of danger. The animal instinct within each person would urge one to either fight or flee. The human way of courage requires one to stay and face what is to come, with "self-possession at the cannon's mouth". "Of all the spies who faced execution I shall remember one for his soldierly manner, his courtesy and his quiet courage. Joseph Jacobs [sic] was a German officer dropped from an aeroplane... was tried by general court martial and sentenced to death by shooting. At dawn came I stood at the entrance to my office as he approached, still limping from his injury, with the stalwart British military policemen escorting him. He must have seen me silhouetted against the electric light in my office, for he walked the few paces towards me with his outstretched hand, and said a few words of thanks. As well as he could, he clicked his heels and walked on. I remember I felt disinclined to return immediately to my office, and walked for for a short way still thinking of that firm handshake and the fast-approaching end of a brave soldier." Colonel Robin Stephens, commandment of Latchmere House, the interrogation centre where German spies were squeezed for all information, also had something to say about Jakobs. [Jakobs] died at the Tower of London on 15 Aug 1941, a brave man. His last words directed the "Tommies" of the firing squad to shoot straight." After the Battle Magazine, volume 11. Grew, Benjamin Dixon. The Prison Governor, 1958. Hoare, Oliver. Camp 020, 2000. Secret Service files, National Archives, KV 2/31 - Karel Richter.